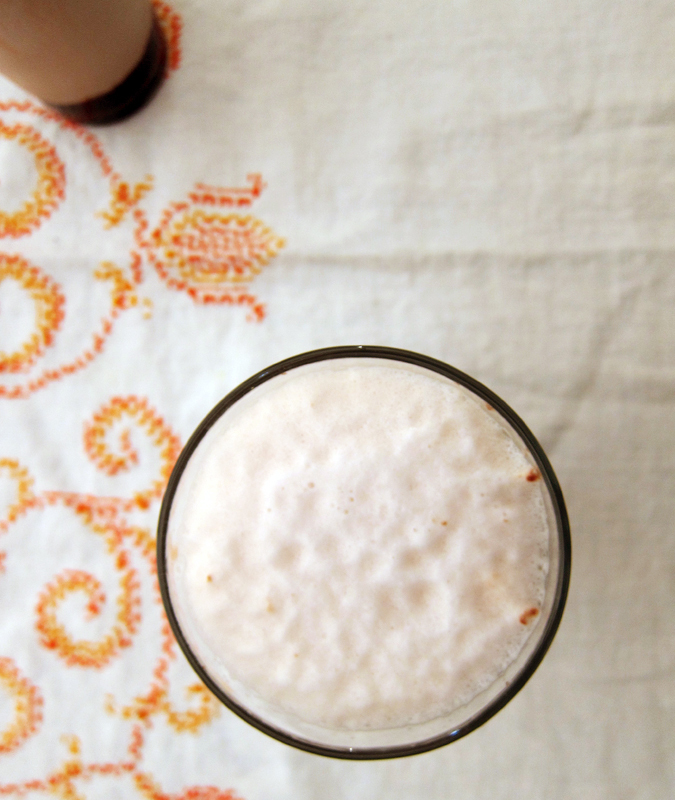 I’ve always been fascinated with the idea of an egg cream. I mean, it’s a total misnomer since there is no egg or cream involved, but when I was little just the thought of a drink with eggs was not refreshing sounding at all. I threw up a little in my mouth whenever my brother would order an Orange Julius at the mall and an egg cream just sounded way worse to my 10 year old ears. Fast forward to last summer when I found myself with a bottle of chocolate syrup and cans of club soda. 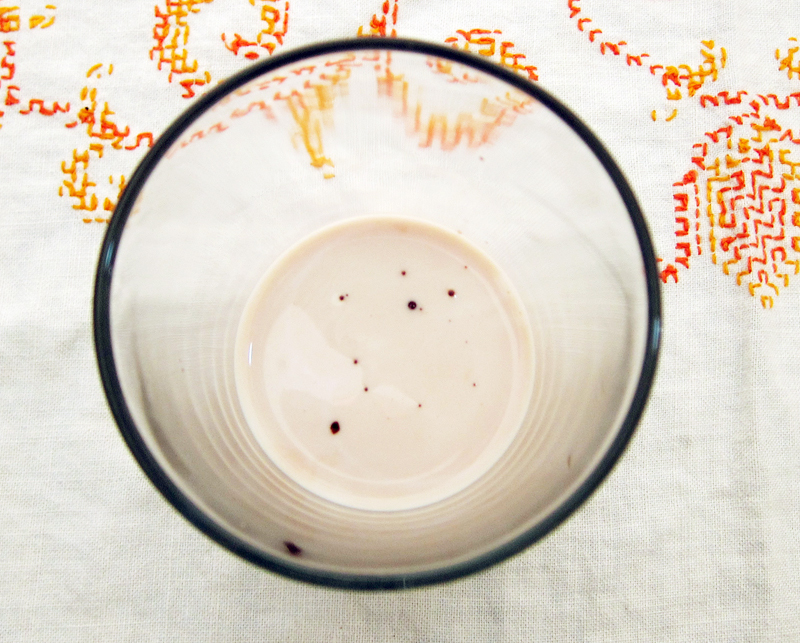 Hello, chocolate egg cream! Really, it couldn’t be simpler – and it shouldn’t affect your gag reflex one bit. One, you need chocolate syrup. Traditionalists would say you NEED to use Fox’s U-BET chocolate syrup, but I found Smuckers to be just dandy. A homemade chocolate syrup would be great too! Two, you need milk. Milk should be cold, ice cold because warm milk is just gross and the opposite of refreshing. I’m sure if you wanted this to be dairy free you could try this with soy, rice or almond milk. If you do try it vegan, let me know how it goes! And the third requirement, seltzer water – but club soda will work in a pinch. If you were old-fashioned, you’d use one of those Mad Men era pressurized seltzer canisters, but a can of club soda still makes a fine, fine drink. Just give everything a big stir at the end and watch out so that it doesn’t over flow because this stuff can bubble up quickly! Now, if you want more of an adult beverage, throwing in an ounce of bourbon wouldn’t be out of line (see the kitchn for a chocolate milk bourbon version). Now, the real reason I’m talking about Brooklyn egg creams is to ply you with a treat so you could help me with NYC tips! I’ll be in Brooklyn for 3 weeks this month and I need all the recommendations I can get. I can tell you that I’m well versed in NYC history after watching the 16 hour long New York documentary by Rick Burns but I need to know about all the other stuff. Like where’s the best happy hour? The best brunch? The best coffee? The best brew pub? The best IPA? The best burger? The best slice? The best healthy food? And because I like to travel on the cheap, these recommendations shouldn’t be fancy or hella-expensive – we are cheap, afterall. We’re planning on doing a lot of picnic-ing since that’s one way to cut down costs, so any well-stocked and well-priced grocery stores or food emporiums that I should know about, please let me know. And because NYC isn’t just about the food (no, really) I do plan on doing some sight-seeing too. We want to explore some of the outer boroughs. The Tenement Museum will be visited. As will the MOMA. And I’d love your recs for any cool music venues, photography/art galleries and spaces, cool walks and that kind of thing. Anything that is a touristy-must do?? Is the top of the Empire State Building worth it? We’ve never been before and it’s kind of like a dream to spend 3 weeks exploring and getting inspired. So please send me your comments and emails! I’d love to hear your must-do New York City tips! elsewhere: Over at Poppytalk check out my Root and Ginger post for the perfect summer tipple. 1. 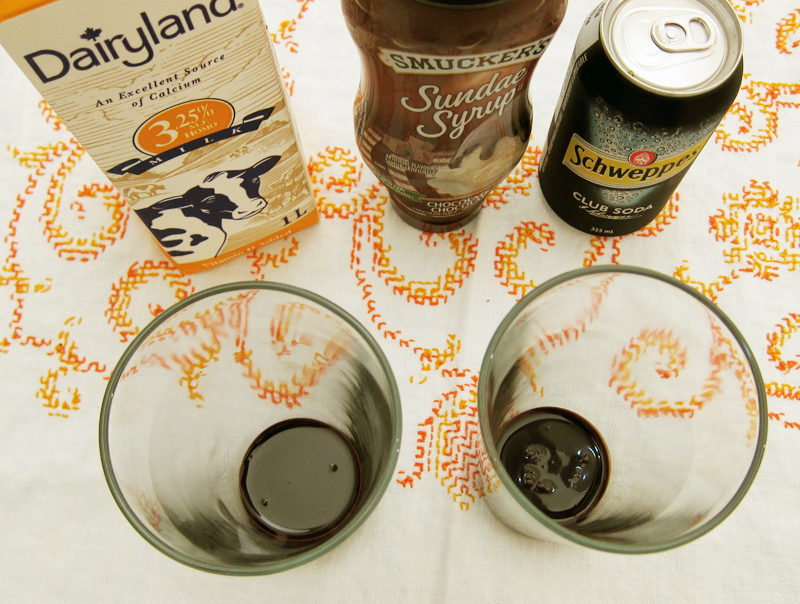 Pour about 1 inch of chocolate syrup in the bottom of two pint glasses. If the pint glasses are chilled, that’s even better! 2. Pour about 2 inches of milk over top. 3. Top up with club soda, half a can for each glass – pour slowly because this stuff will really start to foam up! Stir with a long spoon and drink up! i was always scared of egg creams too! till i had one at EJs lunchonette on the upper east side….YUM! brew – brooklyn brewery – great place to check out their seasonal microbrews & hang out – you can also order pizza to be delivered whilst you play UNO….bliss! burger – if you can come into manhattan you MUST go to corner bistro in the west village. best.burger.ever.PERIOD! not fancy and they serve mcsorleys ale (mcsorleys is about $3 a pop and is the house brew of the oldest bar in manhattan). little in the way of ambiance but such an iconic spot! bbq – fatty ‘cute in brooklyn is AMAZING! the brisket is off the charts and they smoke all of their meats right out back. not to be missed….drinks will rock your socks off too. pizza – best slice in brooklyn is difara, best slice in manhattan is grimaldis. youll find a lot of different answers to this question (obvi!) but im stickin to my guns on this. I’m hardly a NY expert, having really only been there once, in September, but you must go see the High Line. This, along with the Tenement Museum and a taping of The Daily Show, was the highlight of our trip! The Empire State Building (or Rockefeller Center) are most worth it if you really really like high places and can get there really early or really late to avoid the lines, which can be hellish. If you have some kind of coupon, even better. My favorite touristy things are the Staten Island Ferry and Governors Island – both free! Get on the SI Ferry as the sun is going down and you’ll get beautiful day and night skyline views. Governors Island has a lot of stuff to do and also has great views of Manhattan & Brooklyn & the Statue of Liberty, and you can picnic there. A walk across the Brooklyn Bridge is also free, with great views and a good ice cream shop on the Brooklyn side. Google the High Line for a pretty & free elevated park in Chelsea. The Metropolitan Museum of Art has pay-what-you-want entry, so that can be a cheap culture stop. And the local minor league baseball teams (Brooklyn Cyclones & SI Yankees) both have cheap games and stadiums with good views. For grocery stores, Fairway is a NY institution with crazy selection but Trader Joe’s & Whole Foods are good too (and WF is good for celebrity sightings, if that’s your thing). Have fun! Worth the crazy lineup. We waited about 30 minutes, and I think that is standard. Simple, delicious, coal in the brick oven makes this crust heavenly. We walked over the bridge to get here and it was a good experience overall. All the toppings are the same price, go figure. I was videotaping the pizza-making and they quickly waved me away. Worth watching though. Avoid the lineups at the one near the theatre district and head to this one instead with the shorter lineups, and more flexibility in purchasing (i.e. can line up in the morning for an evening show; the theatre area one eats up your afternoon). The surrounding area is very touristy so don’t eat the pizza around here. We purchased some Mamma Mia tix for 40% off. I should provide a disclaimer that we didn’t enjoy the play itself much. I heard from a local that Empire State Building is not worth the agonizing lineups. She tipped me off that Rockefeller Centre is cheaper, has shorter lineups, and you can actually SEE The Empire State Building from it. I agreed with that assessment later, I think it’s also cheaper. I would also recommend the NBC Experience tour, we saw SNL being filmed and Mr. SixBalloons saw RYAN REYNOLDS but I did not. I saw one of the actors from SNL, and they took us through the NBC Morning show’s set. The tour was totally worth it, cheesy but neat. Amazing gyros for $4.50. Crunchy cinnamon-y sweet nuts. Eat them whenever you have a chance because you’ll be dreaming about them when you get back. We bought a few packs of nuts to eat on the plane, and wish we bought way more. Sigh. The food carts get cheaper as you walk away from Times Square. Those are my two cents! Have a great time! Okay, seriously, I went to New York three years ago and I still think about the almond croissants from the Petrossian (right near Central Park) weekly. Doughnuts from Donut Plant probably figure in my thoughts every few months. Have an awesome time. Hey, I went there for my honeymoon in 2009 too. WHAT. I liked the NBC tour too. We got the NYC Citypass, which is a great deal if you’re planning on hitting up all the museums. My favourite was the Museum of Natural History. It also covers the Empire State Building, and we went pretty late at night (it’s open til midnight or 1 am) and there was no line. I say why not go for it, it’s an icon. In Brooklyn, you have to go to Baked! I also went to Grimaldi’s; it was good, but to me, not essential. Everyone is different. I used the Amateur Gourmet and The Girl Who Ate Everything for references. Just do not miss eating at Shake Shack. Oh lord it’s good. There are so many things to see and eat there, you won’t screw up. Motorino for pizza…one in Brooklyn and one in Manhattan on the lower east side. Cinnamon Indian restaurant on Lexington and 28th. A pretzel and hot dog from street carts. Mustard and sauerkraut is the NY way for the hot dog. Penelope’s is a cute little cafe on Lexington around 31st st. You’ll feel like a neighborhood resident. 1. Dim Sum Go Go in Chinatown. Tasty, tasty dumplings. 2. If you get up Harlem way and are into soul food, go to Amy Ruth’s. The Rev. Al Sharpton (aka fried chicken and waffles) are killer. 3. Zabar’s near Central Park. And one non-food recommendation: Since NYC is a city made for walking, consider a foot massage and power nap in one of the sleep cabins at Yelo Spa. It’s heavenly, and provides the perfect bridge between a day in the city and a night on the town. Artichoke Basilles Pizzeri – A pizza joint where they serve essentially artichoke spinach dip on a thin crust pizza. It is heavenly. Pig & Egg – Great breakfast place using local ingredients on Bedford in Brooklyn. If you happen to be able to attend a How I Learned… I highly recommend it, a great night of locals telling stories in a misleading bar that looks like a chinese shop on the outside and classy on the inside. It is a curated show, so it bound to be good. or if you listen to The Moth, I recommend a live show of that too. I just came back from NYC and all my mom and sister and I did was eat deliciously! My favourite place in the whole city was Freeman’s – down a little alley with Christmas lights strung up at the end of an alley: http://www.freemansrestaurant.com/ oh the goodness! I had shaved asparagus with this mustard dressing that I can’t stop thinking about. Mmmm. I’m not s huge cocktail person, but oh, they are delightful there, with big chunks of ginger, or cucumber – oh yum! Yummy Mexican from Señor Tacombi at 267 elizabeth street. Brunch at Hundred Acres was lovely – and they had bacon brittle that I’m still swooning over. Delish! And for the most wonderful window display (and inside displays!) AllSaints Spitalfields, 512 Broadway (between Spring and Broome Streets – hundreds of vintage sewing machines. It’s a stunner. I so enjoy your site! there’s a Target in brooklyn if thats your kind of thing- i love Target! I know that everyone is hepped up about all things Gabrielle Hamilton these days but if I were going to New York I would definitely go and have dinner (or lunch or brunch) at her restaurant Prune. It is in the East Village (at 54 East 1st Street) and can be a bit tough to find but the food is so lovely and unpretentious, not to mention delicious. Not cheap but not super expensive either you can often snag a table (they leave one table for walk-ins) or a seat at the bar if you are willing to get there half an hour or so before they open. Her book “Blood, Bones and Butter” would also be perfect reading material for the plane on your way there if you haven’t already read it! Have a great trip. How AWESOME that you’re coming to NYC! I need to gather my thoughts on the city but if you have any free time, I’d love to meet for coffee or a meal! My biggest advice is to NOT shop at Food Emporium. Ever. At all. They are WAY overpriced. In all honesty, for most things Whole Foods is cheaper and Trader Joe’s is always cheaper. I’ll be back with my thoughts on restaurants and such! And would you believe I’ve never had an egg cream? Too sadly true! I am so happy for you! I miss Brooklyn so much!!! Be sure to get a slice of Di Fara’s pizza. It’s a little place on Avenue J in Midwood. Gotta get ready for work – will write more when I think of some. I’m going to keep an eye on the recommendations here as we’ll be in NY for 6 nights at the end of June and I can’t wait. We’ve been a few times before and the places we’ll definitely be visiting again are Shake Shack (as soon as we arrive), John’s on Bleecker St for pizza, Momofuku Milk Bar, and Pearl Oyster Bar for the lobster roll. In terms of touristy things I would go for the Rockefeller Center rather than the Empire State Building – more space to walk around, shorter queues, and a view that includes Central Park and the Empire State! Have a great trip. best brunch in nyc: MUD. hands down, and they have the best chai lattes i’ve ever had in my life. and it’s adorable. and it’s relatively cheap. also, check out the rivertoriver festival. It goes on all summer long and has a bunch of free concerts and outdoor movie screenings and plays. Best bar trivia is Pete’s Candy Store in Williamsburg, Brooklyn. I am not a pig-eater, but Fette Sau, also in Wiilliamsburg, makes my husband sob tears of joy. The Friday night happy hour at Brooklyn Brewery is an absolute blast. M Wells Diner in Long Island City, Queens,run by Canadians, come to think of it, is producing some of the most creative and delicious food out there. When I make it into Manhattan, I always try to hit Azuri Cafe on 51st and between 9th and 10th for falafel and great, great salads. That’s what I can think of off the top of my head. If I think of more stuff I will report back. The idea of this site is that it posts freebies and deals to it’s subscribers/followers in a timely manner. Like telling you that there’s a bar downtown offering free beer between 5 and 6 pm, e.g. The timeliness may not be helpful, but what I do like is that it gives you the inside scoop on bars, restaurants, and shopping – geared to locals. And something I didn’t get to: Nuyurican Poets Café. I love slam poetry, and they have slams on Friday nights at Nuyurican. I think this is the home of slam poetry and spoken word arts. 3 weeks in Brooklyn sounds perfect for exploring and you are heading to the city during an exciting time of year. Sorry in advance as this got way long! -Union Square Greenmarket is the biggest and best! Go early for the best items (like any other market). -Sahaldi’s in Brooklyn Heights was my favorite specialty store; they have killer bulk bins and their cinnamon almonds are addictive. -Chelsea Market’s Fruit & Veggie Exchange has unique fruits you can’t find elsewhere. It is cash only. -Fairway has an amazing selection of items and good prices. Zabar’s is pricey but fun to check out if you like grocery stores. Trader Joe’s is always the best deal. -Governor’s Island is free and has great views of Manhattan. Go on a Friday afternoon and you can rent a bike for 1 hour free (http://www.govisland.com/html/visit/biking.shtml). -Explore the Brooklyn Flea for vintage clothing/crafty items and eat from the food vendors. -Metropolitan Museum of Art’s McQueen exhibit has been getting rave reviews. If you go there, note that the admission price is pay as you wish. Lots of NYC museums have that same policy or a free night. -NYC has lots of free outdoor movie screenings and concerts during the summer. If you google: free nyc you’ll find lots of listings for these items. Beer: Spitzers on the LES has a great selection of beers on tap. DBA in the East Village is also popular for having a variety of beers. Visiting Brooklyn Brewery is a great idea too. Happy Hour: Verlaine on the LES has $4 Lychee Martinis (and some other things) from 5-10 p.m. and Dove Parlour’s cocktails are $7 from 4-8 p.m. Frozen Treats: The Soft Serve Fruit Co. has soft serve made of only fruit, water and cane sugar. Detour there from The Met and Central Park. Dinner: Grafitti in the East Village is expensive and tiny but so worth it! For a creative veggie meal, go to Westville in the East or West Village. My blog has random reviews from when I lived there. Blondie and Brownie, Grits in the City and Eat Make Read would also be great places to look for ideas. Eat Make Read specifically did a Brooklyn post a while back… If you have any questions, let me know! I have to agree with everyone about DiFara’s – it’s a pain to get there, but so, so worth it. My other favorite, favorite place in Brooklyn is Five Leaves, which is a small cafe that has to-die-for truffle fries and is not too expensive at all. And you are going to share a compiled list with the rest of us, right? Please? So much advice! Anyway, if you go to the Met to see the Alexander McQueen show, try to get there early because there was a 45 minute wait the other day. The Cupcake Cafe at Books of Wonder (18th St between 5th and 6th Aves.) Forget the other ones– these are the really good ones. BTW, the Donut Plant is overrated. DiPalo’s on Grand Street and Mulberry (or Mott)) great homemade mozzarella and Italian things for that picnic of yours. Café Zabarski at the Neue Galerie at 5th Ave and 86th St for a pricy but worth it Viennese experience. The High Line Park is a must-see especially in summertime. The Tenement Museum is super-good; you are guaranteed to love that tour! I can highly recommend Nunu chocolate shop, The Frankies Spuntino for good lunch or dinner, going all the way north to check out Grant’s Tomb then slowly meandering south, a drink in the East Village at Please Don’t Tell (presuming it’s still around…it’s sort of a hipster place, but still really lovely and worth suspending any aversion one might have toward The In Thing To Do). Abraco for coffee and olive oil pound cake. And, timing your walk across the Brooklyn Bridge so that it does not coincide with high noon, when you will (like I did…twice) scorch yourself during what proves to be a much longer walk than anticipated, without any shade. Best brunch is at Cafe Mogador (www.cafemogador.com/default.htm) – fresh oj, fantastic cappuccino, and delicious food! It is a must visit for me whenever I’ve in NYC. Madam Geneva was my favorite expensive cocktail in the city. Gin or Jam over crushed ice with a silver spoon of jam. Sahadi’s is a great middle eastern grocery store on Atlantic Avenue in Brooklyn, Kalustyans http://www.kalustyans.com/ on Lex in Murray Hill is also a great store. They have a lunch counter upstairs which has good cheap food. Murray Hill, also known as Curry Hill, also has Curry in a Hurry, which is a fantastic cheap Indian cafeteria. Definitely walk across the Brooklyn Bridge. If you go to Difara’s for pizza, and you should, make a day of it and go to Coney Island too. I would recommend taking the q train out to the last stop in the morning and walking along the boardwalk from Coney Island to Brighton Beach (lots of good Russian food there, Brighton Bazaar is a good grocery store with lots of prepared foods, good for picnics). You can get back on the q train in Brighton Beach and take it to Difara’s on Avenue J,and then head back to wherever you’re staying. There’s loads of free outdoor stuff in New York in the summer, people have mentioned some good outside free series but just google free events outside NYC or something and you’ll find lots of stuff. Lots of museums are free on Friday evenings, the Brooklyn Botanic Garden is free on Tuesdays. I second the Di Fara recommendations! Just make sure you don’t go there hungry or when you need to be somewhere else very soon because you will not escape without at least an hour wait, maybe even two if you go on a weekend. But it’s worth it! I love Murray’s Cheese Shop. They have great cheese mongers and will let you try everything and help you find new cheeses to fall in love with. They also have lots of other foods that would be great for taking along on a picnic. The one on Bleeker in the Village is also near lots of other cool stuff. You can go online and find a walking tour of the village that you can follow at your own pace (and totally free!) and learn about all the cool stuff that has happened in that neighborhood. There are lots of tasty pizza places and cafes in that area, too. –Shake Shack! The original location in Madison Square Park for the full experience. Handmade frozen custard (specialty flavors change daily), sublime burgers and fries, eating under fairy lights. –Grimaldi’s Pizza in Brooklyn. Worth the wait, and you get to explore the neighborhood DUMBO in the process. –Bryant Park Film Festival. Every Monday night at dusk, although it’s prudent to get there early to get a spot on the lawn. The show old movies; it’s especially fun on Hitchcock nights! –Museum of Natural History. Worth it for the ocean room with the giant whale diorama, alone. –Prospect Park, Brooklyn. Lush and winding and full of cute dogs and people flying kites. –Summerstage, River to River, and Celebrate Brooklyn festivals. Free music! –Coney Island! You’ve just got to. –If you can rent a car or hop on a train, amble out to the Hamptons in Long Island and go to wineries and farmstands and beaches. –Union Square Greenmarket. And bring your camera. Delightful. I second SixBalloon’s comment about Top of the Rock…I’ve never bothered with the Empire State Building but Top of the Rock was kinda fun, especially around dusk. In any case, have fun and enjoy your trip. Looking forward to all your stories when you come back! -Russ and Daughters when you are on the Lower East Side. Wonderful herring (also try the caviar cream cheese). Have a great trip! And thank you for the great blog. Hey! I hope you have a great time on your trip to NYC. The museums are alwasy a lot of fun. If you’re looking for something cool to do on a Sunday afternoon, my cousin dj’s at this annual BBQ cookoff at a bar called Project Parlor in Bed Stuy, Brooklyn. Each week, they have two bbq’ers going at it, and the food is always amazing. The music’s not bad either hehe. Enjoy your trip! Feel free to shoot me an email if you have any questions about it. If you are going to the Tenement Museum you should read “97 Orchard Street” (http://vpl.bibliocommons.com/item/show/273529038_97_orchard_street,_new_york) before you go – a fascinating read about NY immigrants and their food. Several years ago we go the “New York Cookbook” as a gift (http://www.amazon.com/New-York-Cookbook-Firehouses-Restaurants/dp/089480698X/ref=sr_1_1?ie=UTF8&qid=1307127130&sr=8-1 – also available in the VPL system) which has a lot of fun recipes and suggestions of places to eat. – Cafe Lafayette for the best burger (& veggie burger, for that matter), good crepes, moules marinieres, really thick & awesome coffee. – abistro for excellent African-French food, especially the various fish. – Frankie’s Spuntino in Carroll Gardens (& one on the LES) for authentic/homey Italian food. – Also in Carroll Gardens: Mazzola Bakery. Go get a loaf of lard bread (with sausage chunks rolled up inside) and try your best to keep the crumbs away from the pigeons. – Gorilla Coffee (for coffee) and Franny’s (for charred pizza, drinks, olives) in Park Slope. – Peter Pan Donuts in Greenpoint for, uh, donuts. Besides that, there are many authentic Polish bakeries on the main drag of Greenpoint, Manhattan Ave.
– The Brooklyn Inn for dark & atmospheric drinks in an old eclectic building with a history. – Greenwich Village/NYU has the best coffeeshop in NY (if you don’t count coffee carts, which I LOVE): Caffe Dante. They have a three page coffee menu. SO good. Also nearby: excellent cheap falafel sandwiches at Sam’s Falafel House. – If you want to fight through a massive crowd of people, you can go to Balthazar in Soho. Make a reservation if possible. While you’re down there, don’t get caught in the Lombardi’s tourist trap; there’s much better food at L’Asso just around the corner. Or go to Freeman’s Alley for semi-hidden eating! Oh my gosh, when are you going to be there? I’m heading out June 21st. (We should cross paths!) I adore Diner in Williamsburg, Roberta’s in Bushwick (great pizza, though I’ll make no claims about “best” – part of what’s awesome is eating it outdoors in their epic garden), had a great brunch at Flatbush Farms. I also had my very first egg cream when out there this February – at Henry Public, which is an awesome spot for cocktails. Why hasn’t anyone told you about time out ny yet? Check out the website, timeoutny.com, they have a “free stuff to do” tab!! Empire state bldg- skip. Use time out ny to find a great rooftop bar with a view instead and hit their happy hour. Chinatown is fun for an afternoon of checking out the bakeries and grocery stores, don’t miss brooklyn botanical gardens this time of year. Skip the big dumb red ripoff bus for tourists and get the metrocard unlimited each week. Oh! And buy your picnicing wine at trader joes- a you can get a great bottle for less than you will pay for a bad glass of wine around here. After going to union square greenmarket go to city bakery off 5th ave on 17th st for a pretzel croissant- it will change your life for the better. Have fun! It’s such a great place. Just saw your tweet about Queens recs. My faves are PS1 – the best museum in all of New York, in my old ‘hood Long Island City. Down the street from PS1 is an amazing coffee shop called Sweetleaf, and from there you can walk west to the waterfront, to this amazing park right on the east river. It has the most incredible few of the city you’ll ever see. I used to post photos of it all the time. Also in the neighborhood is my favorite bar ever, Dutch Kills. It’s in a super random abandoned area, but it’s this amazing little speak easy that makes fancy cocktails and handcrafts each one. Another idea is to go to Jackson Heights and get Indian food and wander around the largely Indian neighborhood. I like the Jackson Diner best. You’re making my homesick for NYC! 🙂 Have so much fun. My dad grew up on the lower East side and always talked about egg creams. I thought they sounded incredibly gross as a kid and not much better as an adult, sadly. I guess I’m really not a milk girl, even if there is chocolate in there. 🙂 We usually end up going once a year and my parents still go back multiple times. One (somewhat) affordable option is Angelo’s in Little Italy. Classic New York Italian food and has been around forever. I hope you have an incredible trip! Yes, do check out Time Out NY (they have a website as well) for ideas. Some of mine – Madison Square Park is a lovely little park downtown (Madison Avenue, between 23rd and 25th streets). There is an interesting sculpture there now through August, over 40 feet high. I really consider this to be one of the nicest parks in the city. And it is a short walk to Lexington Avenue, where you can find a whole line of Indian restaurants (27th, 28th street area) to choose from for dinner. Some good ones – Pongal, Madras Mahal. Also – try the Hummus Place for a delicious and inexpensive place to eat. There are two in the village, and one on the West Side, and they are all quite good. In the village, there is also ‘sNice, a largely vegan, sandwich and salad place excellent for lunch. Very inexpensive. If you make it to the Carroll Gardens section of Brooklyn, and want to spend a little more, The Painted Pot is a nice place to do pottery painting (although you will need to come back a week later to pick it up, once it has been fired). Within walking distance is Wild Ginger, a vegan, pan-Asian restaurant where the food is good and the decor nice. Afterwards – the Clover Club for drinks, a wonderful bar with lots of history. Read The New York Times, on Fridays especially (when the paper features two arts sections, one for fine arts and one for movies/performances). And don’t travel anywhere without a subway map and a bus map. Then you should be able to navigate your excursions with ease! City Bakery – pretzel croissants! Best Burger: Minetta tavern. You’ll need to make reservations (a month in advance if you want to go on a weekend). I’m not even a burger person and I still have dreams about it. Plus it’s got a classic NYC vibe. I would say, go to Zabar’s for perfect picnic foods!And if you did want to spend a bit or have crazy amazing desserts- Momofuku. Not crazy expensive and amazing! Robertas in Brooklyn for Pizza – try the “bee sting” pizza – totally amazing! And they have a garden on their rooftop! If you like Vietnamese food – go to Republic in Union Square. Union Square also has an AMAZING farmers market – Tues and Thurs I believe. Shake Shack for Burgers/fries/shakes – one location in Midtown and another in Madison Square Park, and maybe even a third somewhere. Pommes Frites – East Village – a big cone of Belgian-style fries with over 20 different sauce options. A cheap snack that’s easy to eat on the move & you’ll do so much walking, you need to build in snack stops! Sake Bar Decibel – also in East Village – look it up on Yelp, you may nearly walk by it, as it is a true hole-in-the-wall (in the basement of a building). Fun noisy place with a bit of a punk rock edge. You must go to McSorley’s Ale House! This place is the real deal for lox! Their pickled herring is also the best I have ever had. Seriously you will regret not going here!! I also love the location. Petite Oven located in off-the-beaten track in Brooklyn at 276 Bay Ridge Avenue. Take the R train to Bay Ridge Avenue and 4th Ave, the rest. is at the corner of 3rd Ave and Bay Ridge Ave. Great food, very reasonable, call before you go they are very small 718-833-3443. Sweet Melissa’s Bakery, I love love their stuff. 276 Court Street also in Park Slope at 175 7th Avenue, she has a location in Manhattan but I have never been there 75 W. Houston St. There are great places in Brooklyn, and I am sure you will get tons of recommendations. These are two that aren’t very well know to outsiders and I you have gifted me with great recipes over the years. Have fun in my hood. Also how could I forget. But this is really really off the beaten path. Spumoni Gardens (the pizza is pretty good) but the scene is the thing. It’s located at 2725 86th Street. I suggest just getting half a slab (I assume you will be with friends and slabs are how you order the pizza there) and taking it all in. I do believe you’ve hit on a Chocolate Soda, like the one I used to be able to order at the Dairy Queen in Owen Sound, Ontario. the club soda and chocolate combo are really to die for!! Egg cream? Never heard of it but I have ordered orange juice from Orange Julius in the 1980s so maybe I tasted it without knowing I did. I always have a case of bubbly water in the house so I may just try this out one day. The HighLine is an amazing and fun place to visit, and can be combined with a trip to the Chelsea Market for lunch and then gallery hopping around the Meatpacking district and Chelsea. I don’t think that the Empire State Building is worth it, but the Top of the Rock at Rockefeller Center is wonderful. I love the Statue of Liberty and Ellis Island, and Governor’s Island is a fantastic park and a great way to spend an afternoon. Central Park is always worth a visit. The Tenement Museum and MoMA are two of my favorites, so those are always good choices. I also love the Museum of Arts and Design, the Met and the Rubin Museum for Asian art. In terms of walks, I highly recommend the Big Onion walking tours. Their guides are wonderful, and the Lower East Side food walking tour is a great way to see the area and try some food. I love walking over the Brooklyn Bridge, down through Brooklyn Heights and along the Promenade, which has one of my favorite views of Manhattan. I live in Williamsburg, Brooklyn, and if you’re looking for some good food, I can’t recommend the neighborhood enough. Check out Smorgasberg on Saturdays for lots of great food vendors all in one place. Some favorites restaurants, however, are Pies N Thighs for great friend chicken, Zenkichi for pricey but incredible Japanese tapas, Saltie for the best sandwiches, Chimu for great Peruvian food, and Egg for amazing brunch (be prepared to wait though!). I hope this helps, and that you have a wonderful visit! I hope that your trip is fantastic! I also selfishly hope that you blog about the highlights of your trip. I love New York a lot a lot. I was only there for a few days. The first commenter is wrong on two fronts- Fatty-Cue was recently shut down for having something like 137 health code violations. I would avoid it for a while (though it has re-opened). Also, Grimaldi’s is not in Manhattan, it’s in Brooklyn Heights (and delicious, go there). I live in Williamsburg, let’s get dinner! Hi! It’s Caitlyn from foodwith wit. I have a suggestion and a story. I work at DIA:Beacon a contemporary art museum just north of the city by train. http://Www.diamuseum.org When I read your post I decided to put the new York and Brooklyn egg cremes on the menu in honor of you. I hope you are enjoying New York and all it has to offer. If tou get a chance come visit the museum. It is beautiful, on the Hudson, great art and a wonderful bookstore!! Enjoy and Bon appetite!! 1) COFFEE- Peelz in the East Village…grab a cupajoe and a build-your-own breakfast sandwich…scrumptious. 2) Washington Sq. Park- June is the perfect time to spend some time watching the crazies hustle some chess games while innocent little’uns splash around in the fountain to the soundtrack of local buskers. 4) Red Rooster for a culturally satisfying dinner. > Cheap ballet tickets on Friday nights (dress rehearsals)…gorgeous and cost-effective. Most important advice- don’t spend more than 2 minutes looking for any of these places; simply walk around, take turns with your husband choosing random subway or bus stops…get out…and enjoy! Best! Thanks so much for all your suggestions! I went to so many wonderful places and will be doing a NYC write up soon!!! Egg creams do sound scary but I love the name and really need to try one! can you use Sprite as a substitute for Club Soda? Matt, I think adding Sprite would make the drink too sweet and I’m not sure about the citrus flavourings….but if you’ve got an adventurous sweet tooth, go ahead!